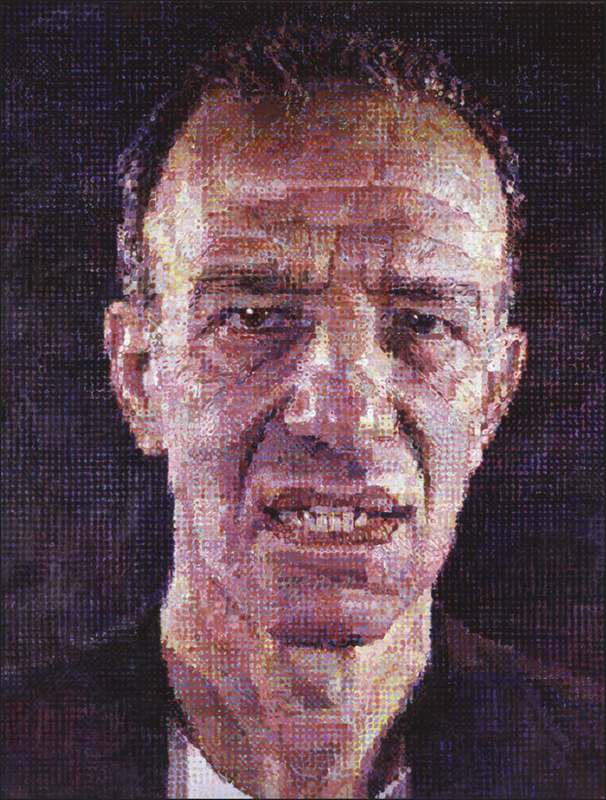 Close’s defining works were, more often than not, personal yet larger-than-life portraits of fellow friends, starting from the time they were still in obscurity and repeating onwards throughout his life as a way to continue remembering them due to his prosopagnosia (an inability to recognize faces). What Annie Leibovitz did for photography, Chuck Close did for painting. He depicted Philip Glass, Cindy Sherman, Roy Lichtenstein, and many others, using photographs (from which he could better discern faces in) as his basis for their construction. Alex Katz’s work around this time revolved around landscapes and fashion shows, already bored with the portraits and prints that he made a decade before. Around the year Close made this portrait of Katz, Aretha Franklin got into the Rock’n’Roll Hall of Fame, President Reagan caught fire for his poor handling of the Iran-Contra affair, and Katz began populating his enormous canvases with larger-than-life depictions of night scenes and flowers. Seems to be a running theme in his life that Katz refused to stay in one corner of a creative venture, on top of being a history buff and a fitness fanatic that nowadays is well into his nineties, still challenging runners seventy years his junior to a competitive sprint. The organization responsible for acquiring Close’s portrait, the Georgia Welles Apollo Society, shares half of its namesake for Henri Matisse’s Apollo, whose subject was the Greek god of light, medicine, and the fine arts, and Georgia Welles, a woman who voluntarily took the position as its chairwoman and dedicated the majority of her life to art and philanthropy. The Society was founded in 1986 by Georgia and her husband David, and has since acquired over 50 works for the Toledo Museum of Art. “Georgia Welles Apollo Society.” 2018. The Toledo Museum of Art. March 14, 2018. https://www.toledomuseum.org/support/georgia-welles-apollo-society. Jarchow, Bruce. 2012. “Georgia Elmes Welles '48 (2006).” North Shore Country Day School. February 22, 2012. https://www.nscds.org/page/stanton-news-detail?pk=800301. “Narrative Bio.” n.d. Alex Katz - Biography - Narrative Bio. Alex Katz Studio. Accessed March 1, 2019. http://www.alexkatz.com/biography/narrative_bio. “Timeline: 1987.” n.d. World History Timeline. Accessed March 1, 2019. http://www.fsmitha.com/time/1987.html.